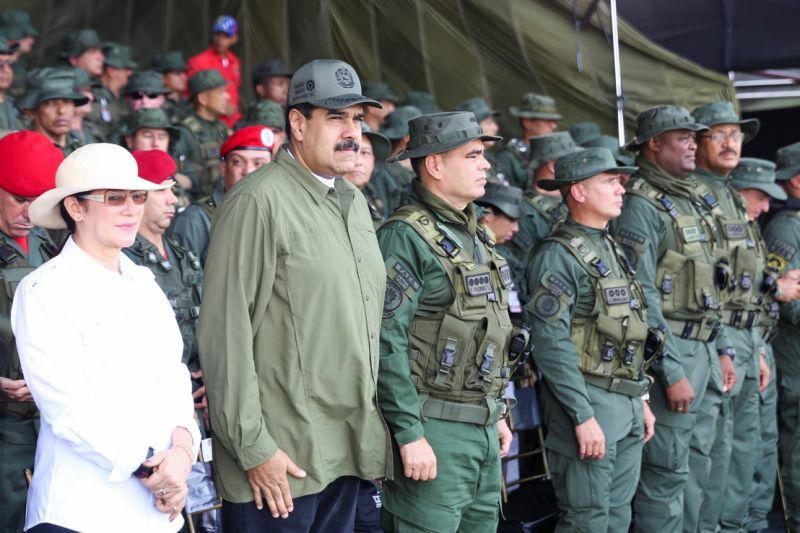 Venezuela's President Nicolas Maduro called on his nation's military leaders Tuesday to prepare for war against the U.S. days after the Trump administration banned Venezuelan officials from entering the nation. The Trump administration has taken a hard stance against Maduro's regime by banning money lending to Venezuela's government or its state oil company PDVSA, and passing sanctions against Maduro and his top officials. "The future of humanity cannot be the world of illegal sanctions, of economic persecution," Maduro said. It's unlikely Maduro has the manpower to stand up to the U.S., which has a much larger military. Maduro has maintained power in Venezuela despite mounting political and economic crises that has seen months of violent, anti-government demonstrations across the South American nation. Defense Minister Vladimir Padrino has backed Maduro during the upheaval, but some critics have begun a whisper campaign suggesting that the military could break away and support a coup against the president, Herbert Garcia, a former senior army general and minister, told Reuters in August. There have been three attempted military coups in Venezuela since 1992. Russia has defended Maduro in recent months, going so far as to accuse Trump of preparing for an invasion of Caracas. "We are strongly against unilateral sanctions against sovereign states," Russian Foreign Ministry spokesperson Maria Zakharova said in August. "We will carefully analyze the implications of the sanctions imposed by the United States, and their possible effect on the interests of Russia and Russian businesses. We can already say that they will not affect our willingness to expand and strengthen cooperation with the friendly nation of Venezuela and its people." President Donald Trump directed his penchant for insulting world leaders toward Venezuela during a United Nations speech earlier this month. He said Washington could intervene in Venezuela to help its citizens "recover their country"
Maduro oversaw a disputed election earlier this year to muzzle the elected national assembly by creating "constituent assembly" in its place.